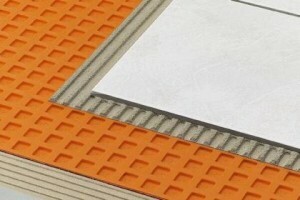 Schluter-DITRA is designed specifically for ceramic tile, porcelain tile and dimension stone installations. 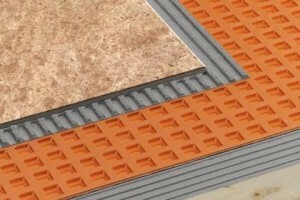 Schluter-DITRA serves as an uncoupling layer, waterproofing membrane, and vapor management layer that accommodates moisture from beneath the tile covering. Further, DITRA performs all these functions while still providing adequate support/load distribution for the tile covering. Schluter-DITRA-XL is designed specifically for ceramic tile, porcelain tile, and stone tile installation and serves as a waterproofing membrane, uncoupling layer, and a vapor management layer that can be used to accommodate moisture that can be found beneath the tile covering. One of the benefits of Schluter-DITRA-XL is that it performs all of these functions while still providing adequate load distribution and support for the tile covering. Schluter-KERDI is suitable for floor and wall surfaces where protection against the penetration of water and moisture or other harmful substances is necessary. 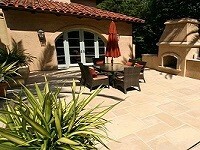 Surfaces include areas surrounding swimming pools, showers, and tub surrounds. Industrial applications include breweries, dairies and the food industry. In order to get the full effect of Schluter-KERDI it is important to verify that the substrate is clean, even, free of moisture, and load bearing. 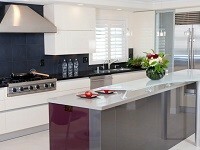 Surfaces that inhibit proper adhesion must be removed or appropriately treated. Schluter-TROBA is a reliable and permanently effective drainage system that is made to be used over sloped waterproofing layers. It consists of a pressure-stable polyethylene sheet with perforated studs that form vaultlike cavities between the waterproofing layer and the mortar bed. Any water penetrating the tile covering and the mortar bed passes through the perforations located at the sides of the trapezoid-shaped studs to the sloped waterproofing layer, where it runs off freely through the cavities to the drainage exit. 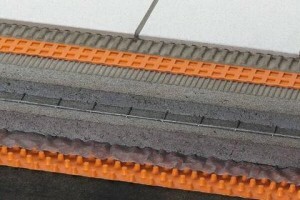 Schluter-TROBA-PLUS is a reliable and permanently effective drainage layer that should be used in horizontal applications over sloped waterproofing layers. 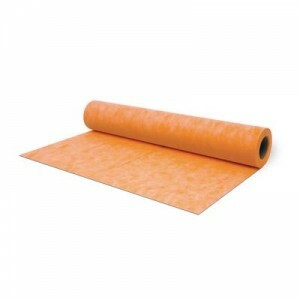 It consists of a high-impact, studded polyethylene sheet covered on one side with a water-permeable filter fabric. The fabric-enhanced studded side, with which the surface covering assembly rests, is meant to act as a high-capacity drainage plane. 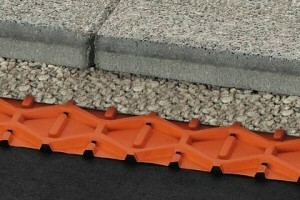 Schluter-TROBA-PLUS is also constructed to provide protection for the waterproofing layer, as the closely positioned studs, shaped like truncated cones, have an extremely high load-bearing capacity and distribute loads evenly over the entire waterproofing surface.